While many uncertainties still linger in regards to the specifics of climate change, some basic facts are definite. The most sure and important fact is that the climate is shifting rapidly, due to anthropogenic causes. As humans continue to burn fossil fuels and emit greenhouse gases, the overall global climate alters. This, in turn, creates environmental issues, such as flooding, droughts, heat waves, and extreme storms. These events will then threaten individual human well being. Major decisions are needed to be made in order to respond to the threat of climate change and ensure human safety. However, these decisions can be difficult, due to the uncertain nature of exactly how and when the climate is going to change. Many of these uncertainties are mitigated by using general circulation models, or global climate models (GCMs). GCMs use predicted emissions scenarios to make projections of likely temperature, precipitation and other meteorological element changes over time. These projections can then be used to inform analyses regarding needed adaptations and changes. Responses can be tailored based on the predicted amount and nature of the climatic change in the specific area explored. 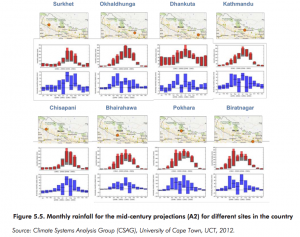 Using GCMs, we have an idea of how the climate of Nepal will change over the next century. It is certain that the overall temperature will increase by between 2 and 6 degrees celsius. This temperature increase will then result in more extreme hot days and more heat waves throughout the country. While there is are broadly similar projections between models, space, and seasons, the precise change varies based on emissions scenarios (IDS-Nepal 56). Despite the question in exact amount, the certainty behind the increase allows the government to make response decisions to insure safety and security throughout the country. These extreme heat waves will threaten individual health safety, along with agricultural security. Alterations in precipitation are far less certain than those for temperature increase. According to the report, there are very dissimilar findings between models, regions, and seasons. Some predictions estimate a decrease by 30 percent of annual rainfall, while others found an increase of over 100 percent. It is likely that there will be an increase in rainfall during monsoon seasons, along a greater frequency of heavier rain days throughout the year (IDS-Nepal63). While GCMs have grown far more accurate over the past several decades, they still have some limitations. Forexample, due to the drastic variations in elevation and climate in Nepal, it is difficult to accurately predict how the climate will change in precise locations throughout the country. Most climate models work at a grid resolution between 150 km and 300 km, but elevation shifts by over 8000 meters in less than 250 km between the Terai and the high mountains (IDS- Nepal 57). Also, future depends heavily on exact amounts of greenhouse gases emitted, which is still uncertain. In addition, it takes months to calculate these models, and a small variation in original inputted data can shift the entire outcome. While these inaccuracies may be frustrating, climate models are still essential for making decisions and showing likely trends for the future, even if there are some variations. GDMs have become an essential tool for defense against probable climate changes, despite their limitations. Source: IDS-Nepal, PAC and GCAP. Economic Impact Assessment of Climate Change in Key Sectors in Nepal. Kathmandu: IDS-Nepal, 2014. This entry was posted in Risk and resilience and tagged climate change, global climate models, nepal, precipitation, temperature, uncertainty. Bookmark the permalink.